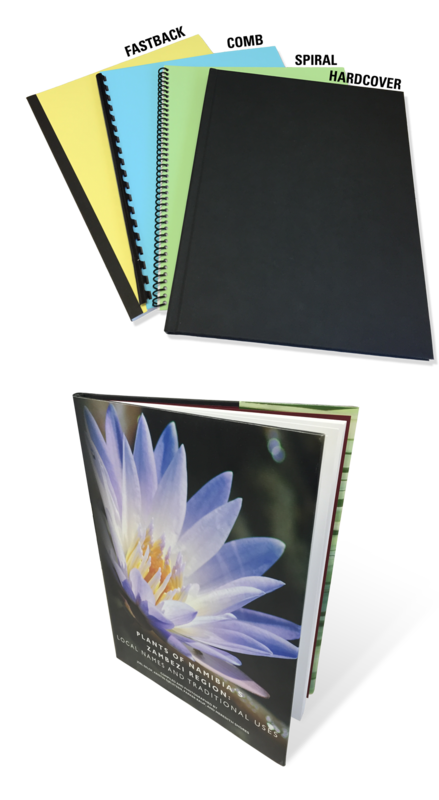 Print & Copy Services offers a variety of binding options for your prints, including Comb Binding, Spiral Binding, Fastback Binding, and Hardcover Binding. Great for prints of nearly any size, up to 11". There is no minimum number of sheets needed, and we can bind up to 150 sheets per comb or spiral. We recommend spiral binding for documents that will see a lot of wear and tear, however, comb binding offers greater stability for documents with fewer pages. A professional option for reports, books, and class notes. Fastback binding offers great versatility for a variety of document sizes. We can bind documents as small as 30 sheets (60 pages 2-sided), all the way up to 350 sheets (700 pages 2-sided). Fastback binding is the same type of binding that is used on the course packs sold in the bookstore. Hardcover binding is a beautiful option for photo albums, gifts, and any document that should have the best possible presentation. We offer options for landscape and portrait oriented pieces. Hardcover binding is only available for 8.5x11. * If desired, a dust jacket can also be printed to accompany your hardcover binding.